When you think about the various things that can go wrong in the kitchen, a significant proportion of them are caused, in one way or another, by overcooking. Whether it's shoe-leather steaks, stringy chicken breasts, drab, flaccid veggies, or even rubbery hard-boiled eggs, all of these issues are the result of overcooking the item in question. And "overcooking" is merely another way of saying getting it too hot. If only there were a cooking technique that guaranteed you would never overcook your food ever again—without having to worry about timing. Even if you forget about it and let it cook too long, it would still be perfectly cooked. Sounds ridiculously too good to be true, but it isn't. It's called sous vide cooking. And while it might not be the simplest technique in the world, it takes all the guesswork out of cooking meats, poultry, vegetables and eggs. For some folks, knowing that their food is guaranteed to be cooked perfectly is worth the additional complexity that comes with sous vide cooking. Sous vide (pronounced "soo-VEED") is a technique that involves sealing food in plastic, then immersing the packet in a hot water bath set to a specific constant temperature using a device called an immersion circulator. The circulator is essentially a stick you can place into any vessel of water to heat the water to the desired temperature. The device maintains that exact temperature, while also circulating the water around the vessel so that the food cooks evenly. Maintaining a constant, specific temperature ensures that your food is heated to a precise temperature. In other words, if you want your steak cooked to 135 F, just set the temperature of the water to 135 F. That's how hot it will get, and not one degree hotter. Overcooking isn't physically possible with the sous vide technique. Remember: Overcooking is simply a function of ingredients getting too hot. This method of cooking differs from roasting, for example, because air is not a good conductor of heat. The air in an oven would need to be heated to 350 or 400 F in order for the center of the steak to reach 135 F. Despite air's poor conductivity, an oven will eventually heat your steak beyond 135 F, to where the inside is far past the 160 F that constitutes well-done. Of course, an oven set to 350 F can't heat anything higher than 350 degrees, and the same is true with sous vide. Thanks to the immersion method, and the fact that water is a good conductor of heat, the temperature of the water and the temperature of the food are always effectively equal...or at least, they equalize over time. One downside of sous vide cooking is that it might take an hour to cook a steak. Of course, the upside is a steak done perfectly to your liking, with no chance of overcooking. With this fail-safe function in mind, you could conceivably set the water to 135 F, and your steak would never get any hotter than that—even if you left it there all day. This isn't recommended for two reasons: One, because it would create a food safety hazard, and two, because it would eventually cause undesirable changes in texture. That said, a steak can stay in the bath for several hours and still come out perfectly medium rare. One thing the sous vide method will not do is produce a brown crust on the outside of your meat, nor will it turn chicken skin crispy. The solution is to sear it afterward. You don't want to skip this step, because while your steak might be perfectly cooked on the inside, there is nothing perfect about a limp, gray-colored steak. Sear it for a couple of minutes on each side in a hot skillet right before serving. As long as the skillet is super-hot, you shouldn't have to worry about the extra cooking time raising the temperature of the interior. Plus, you can always set your immersion circulator to 125 or 130 F instead of 135 if you're concerned about maintaining that medium-rare. A skin-on chicken breast or thigh will need to be crisped up in the same way. Note that chicken breasts may need to be cooked to 155 F in an immersion cooker, while chicken thighs require 175 F (consult your manual). Keep in mind when planning your meal that foods with different target temperatures can't be cooked together. 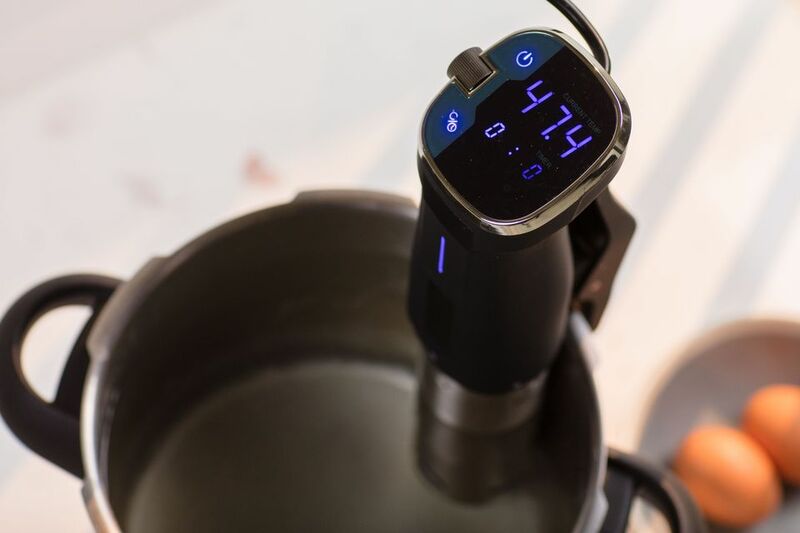 The sous vide circulator. This is the heart of the system, and there are a wide range of models available — even some equipped with Bluetooth. In theory, you could sous vide on the stovetop with a pot of water, using a candy thermometer to monitor the water temperature. You'd have to make ongoing micro-adjustments to the heat to keep the water at a constant temperature, however, which might be more trouble than it's worth. A vacuum sealer or zip-top freezer bags. A vacuum sealer is preferable, since it removes all the air from around the food, helping water surround the food more closely. On the other hand, freezer bags allow you check the temperature of the item with an instant-read thermometer, then re-close the bag to return to cooking. A container for the water. You can use a pot, of course, even though it's the circulator and not the stove that provides the heat. A Dutch oven works well, since its cast-iron construction helps maintain a consistent temperature. You can use any container that is safe up to a temperature of 212 F (again, consult your manual).